"For him (Harrison) to be alive after three years, especially being front-declawed, is pretty amazing." Harrison is not only a very brave and resourceful cat to have survived three years on his own in inclement Michigan, but a lucky one as well. That is especially the case in light of the fact that his owner, Terri Essex, cruelly and inhumanely had previously divested him of his front claws. She compounded that cold-blooded atrocity by leaving him with a house sitter who carelessly allowed him to escape while she was away in Albuquerque. It therefore came as quite a surprise to her when he turned up about two weeks ago in Spring Lake Township, which is approximately thirteen and one-half miles south of Muskegon where she lives. "It's unbelievable!" she exclaimed to the Detroit Free Press on November 20th. 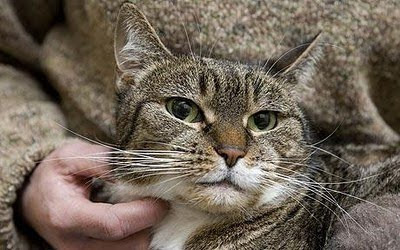 (See "Purr-fect Reunion: Missing Cat Back with Owner after Three Years.") "I always felt like he wasn't dead, like someone had taken him." 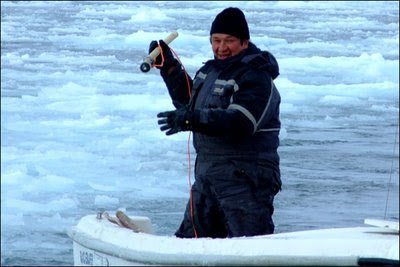 Although his trappers theorize that he survived that entire period on his own, that is highly unlikely. First of all, as an indoor cat he had to learn how to survive on his own and that took time. Secondly, Michigan winters are brutal and food is scarce. Consequently, someone must have been feeding and sheltering him for at least part of that time. Of course, it is conceivable that he could have lived off of the food that some restaurant tossed out every night and found shelter under a nearby building. Even under those favorable circumstances it would have been quite a feat. In any case, hungry and cold cats, like similarly situated men, are forced into desperate acts which in turn place their lives in even greater jeopardy. More importantly, it is difficult for declawed cats to catch and subdue prey. Perhaps even more vital, declawed cats are neither able to defend themselves against predators, both animal and human, nor to climb trees and buildings to safety. "For him to be alive after three years, especially being front-declawed, is pretty amazing," Jill Bannink-Albrecht of the Harbor Humane Society in West Olive summed up the case against onychectomies to the Detroit Free Press in the article cited supra. These procedures are not only excruciatingly painful but superfluous as well. Scratching posts can be installed indoors for practically nothing and cats can be presented with inexpensive rolls of toilet paper, paper towels, and boxes to dismantle. Furthermore, there are a myriad of humane methods that will deter cats from using furniture in order to hone their nails. In the final analysis it really does not make any difference if a cat defaces a piece or two of furniture so long as it is happy. Besides, overweight visitors, smokers, drinkers, messy eaters, and those who fail to wipe the mud off of their shoes before entering do considerably more damage to furniture and rugs than cats and no one would dare to suggest that they have either their fingers cut off, their teeth removed, or that their excess blubber be excised via liposuction. While leaving a cat in its own home and in the care of either a house sitter or a cat sitter is far preferable to uprooting it and warehousing it in a disease-ridden kennel, even those procedures are not foolproof. Of the two, cat sitters are the better bet because of their experience with the species. Their references also can be checked beforehand. Even if declawing were not cruel, painful, and unnecessary, indoor cats get lost every day and need their claws in order to survive in a hostile world. Essex got away with her barbaric and careless treatment of Harrison but it is doubtful that the past three years were anything but traumatic for him. It therefore would not kill her to invest a few shekels in cat fencing so that he could spend some time outdoors in an environment that is safe for a declawed cat. Considering how wretchedly she has treated him, she owes him that much. Finally, Harrison's plight is yet another prime example of how so many individuals insist upon denaturing cats so as to turn them into compliant appendages of their, in most cases, rather cluttered personal and professional lives. Cats, on the other hand, should be accepted for the exquisite creatures that they are and anyone unwilling to do so should not be allowed to adopt them. Lawmakers and shelters could help to put a stop to this type of flagrant abuse by following the sterling example set by West Hollywood in 2003 when it banned declawing over the concerted opposition of, predictably, the moneygrubbing and inhumane California Veterinary Medical Association. Photo: Jordan Travis of the Grand Haven Tribune. 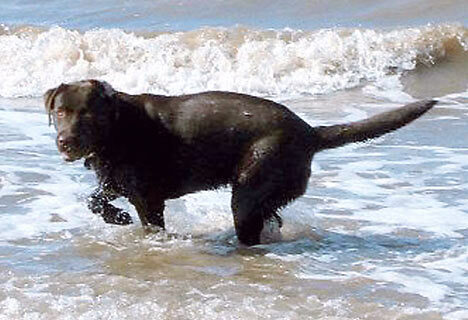 "Oscar is the first creature to have a prosthesis that is osteointegrated, skin-integrated and part of a moving joint. It is a miracle of biomechanics." 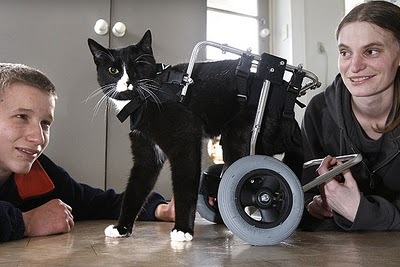 Rudimentary prostheses, such as crutches and walking sticks, are relatively easy for humans to manipulate but completely out of the question as far as disabled cats are concerned. 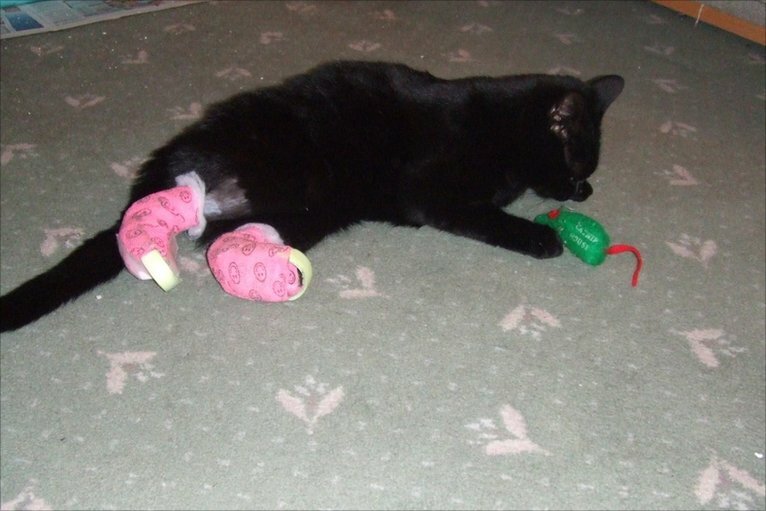 Consequently, veterinarians and orthopedic surgeons have turned their attention in an entirely different direction in order to restore mobility to cats that have lost the use of two or more legs. Thanks principally to the pioneering work of neuro-orthopedic surgeon Noel Fitzpatrick of Fitzpatrick's Referrals in the Eashing section of Godalming, Surrey, and Gordon Blunn of the University College London, an alternative is now available in the form of bionic leg implants. 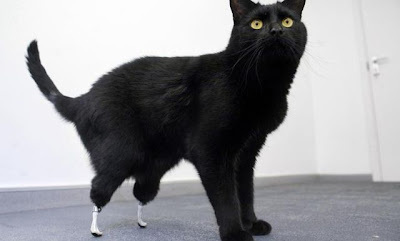 Known as intraosseous transcutaneous amputation prosthetics (ITAPs), these custom-built implants are fashioned out of titanium and other metals and then inserted through holes that are drilled into cats' ankles at the point of amputation. The glue that holds the entire process together is a naturally occurring mineral form of apatite calcium known as hydroxyapatite, which is precisely what gives bones and teeth their rigidity. Although it can be used as filler in order to replace amputated bones, in this instance its main function is to stimulate the growth of bones into the prostheses. In short, it is designed to mimic the way in which a deer's skin and fur coalesce with its antlers. It also is necessary in order to prevent both infection and rejection which often occur when metal implants are attached directly to bones. Once the implants take root and the cats' incisions heal, prosthetic paws made of rubber and metal are attached to the external portions of the implants. Cats then are left with bionic legs that not only will support their weight but also bend just like regular joints. They thus are able to run and even climb stairs in addition to normal walking. He probably would not even be alive today if he had not been promptly discovered by an unidentified female bicyclist who took it upon herself to contact his owners, Mike Nolan and Kate Allan. "Complete panic at that point. (Oscar was) covered in blood (and) bits of flesh. It was very gruesome," Nolan later recalled for the benefit of the BBC on June 25th. 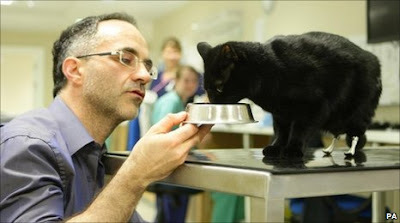 (See "A Cat from Jersey Has Shot to Fame as the 'Bionic Cat'.") "It was very traumatic. I was convinced we were going to have to put him down at this point." Fitzpatrick was equally quick in his inhumane prognosis. "We will have to put new feet on him or put him to sleep," he told the Daily Mail on June 25th. 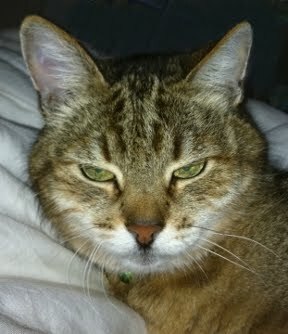 (See "Oscar the Bionic Cat: Pioneering Surgery Gives Poor Moggie (sic) Two False Back Legs.") "The procedure has never been done before." First of all, Fitzpatrick's and Nolan's assertions that they are entitled to decide whether Oscar lives or dies is based solely upon the long ago discredited notion of might makes right and has no foundation whatsoever in either veterinary medicine or morality. If and when Oscar should decide to make his quietus he simply will stop eating and wither away; human intervention is neither needed nor warranted. In addition to the assistance of the bicyclist, Oscar also benefited mightily from the emergency veterinary care that he initially received from Peter Haworth of the New Era Veterinary Hospital in the parish of St. Savior who cleansed and dressed his wounds as well as put him on painkillers. He also was the individual who referred Nolan and Allan to Fitzpatrick. Once arrangements had been made for Oscar to receive the experimental implants, he first had to be flown from Jersey to Surrey and that roundabout ordeal took eight hours. Next, his gait had to be studied and measured so that the implants would work properly. He supposedly is able to do nearly everything except climb trees. Of course, from now on his outdoor rambles will be supervised and playing in maize fields is strictly verboten. "He has taken to his new feet very well," Nolan told the BBC in the article cited supra. "He is running about, walking as a cat should, eating (and) sleeping. It's phenomenal really." If all of that is indeed true, it nevertheless is odd that he still is cooped up at Fitzpatrick's surgery all these months later. The official explanation is that Fitzpatrick wants to continue to closely monitor his progress for an unspecified period of time. C'est-à-dire, he has become Fitzpatrick's prized guinea pig. For his part, Nolan does not have any idea when Oscar will be allowed to come home but he and Allan are planning on visiting him sometime in the near future. "He walks around beautifully on his new feet and if it wasn't (sic) for the white plastic on his feet, you would never be able to tell the difference," he told Channel Television of St. Helier on November 12th. (See "Oscar the Bionic Cat Makes Great Recovery.") "But with him not being here in Jersey, we do miss him." Lurking in the background is the disturbing issue of exactly what will happen to Oscar if the implants ultimately prove to be a failure. "Without this surgery he wouldn't be here," is the answer that Allan provided to the BBC. "It's as simple as that." The best retort to that piece of sottise is that simple, uncaring minds are easily satisfied with simplistic solutions to complex moral conundrums. Furthermore, the warped reasoning that emanates from Allan, Nolan, and Fitzpatrick is truly a thing to behold. In particular, how that anyone could consider it cruel to allow a cat with only two paws to go on living while yet at the same time knowingly subject it to months of endless manipulation in Fitzpatrick's surgery is mind-boggling. For Oscar's sake, the implants had better work if for no other reason than to put the kibosh to whatever mischief Allan, Nolan, and Fitzpatrick have up their sleeves. After all the pain and suffering that he has been put through it could be argued that no cat deserves to live any more than Oscar. If Allan and Nolan no longer want him, he should be offered to either the public or some rescue group. Like Oscar, he also was rescued by bicyclists only in his case his saviors were ten-year-old Kyle and eight-year-old Bryce Billingslea who later adopted him. Although his paws later were amputated, at last report he was getting along just fine. 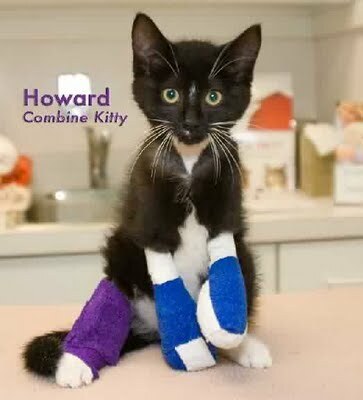 It would be marvelous so see Howard fitted with prosthetic paws but, considering Fitzpatrick's attitude toward cats with disabilities, he probably is better off getting by on two legs. Besides, since the implants retail for £2,000 apiece on top of Fitzpatrick's not inconsiderable fee, the point is largely moot because there is little chance that Howard's guardians ever will be able to afford the procedure. Both of these cases additionally highlight the need for farmers to be held both criminally and civilly liable for all the cats and other animals that their combine operators maim and kill each year. That is especially the case in light of the fact that these tragedies could be easily prevented if only they would take a few minutes beforehand and clear their fields of animals. Bicycling is not only the environmentally-friendly and energy-saving way of getting around, but it saves animal lives as well. Unfortunately, it is not without its dangers in that the same individuals who run down animals and pedestrians also target bikers. After Blacky crawled home veterinarians determined that he had suffered unspecified damage to his spinal cord that had robbed him of the use of his rear legs. Parroting Fitzpatrick, the attending medical men advised Broomhall to kill off Blacky. Short on funds, she turned to the Internet for both moral and financial support. "We put messages on Trade Me and the response was fantastic," she told The Press of Christchurch via The Timaru Herald on August 19th. (See "Blacky (the Cat) Gets His Wheels.") "People told us not to put him down and we ended up with numerous offers to help out." 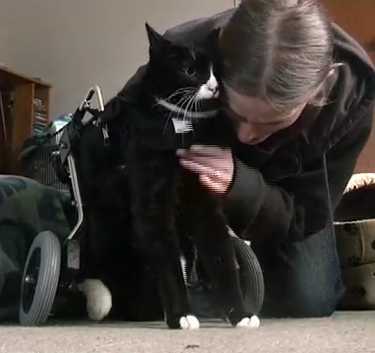 In fact, thirty users of the online message board chipped in NZ$300 which covered precisely half of the NZ$600 price tag on Blacky's wheelchair. Broomhall still was left with a NZ$2,000 tab to cover the removal of his left eye as well as other expenses relating to the treatment of his spinal cord injury. "It's unbelievable how people can be so generous," she told The Press. "He (Blacky) appreciates everything you do for him." Not unexpectedly it has taken Blacky a while to get used to his new wheels and he occasionally has a mishap but overall he is doing rather well. "His strength and determination is (sic) what's getting him through. We're very proud of how far he's come," she declared in a touching video that accompanies the article cited supra. (See "Wheel Chair (sic) Cat.") "He's just doing tremendously well." In addition to creating bionic legs, Fitzpatrick is credited with constructing the first artificial knee for a cat. That occurred presumably sometime last year although that is only a guess owing to the English media's annoying habit of omitting dates. 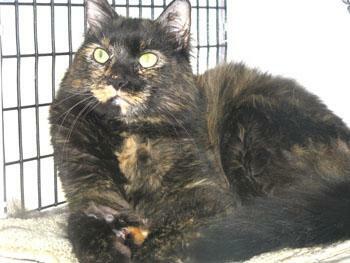 Missy's injuries were so extensive that it is truly amazing that she even survived. One of her rear legs was not only broken in eight places but the skin and tendons had atrophied as a result of a constricted blood flow to that area. Even part of her skin had fallen off thus leaving the bone exposed. A collagen mesh fashioned out of a pig's bladder was used in order to both cover the bone and stimulate the growth of tissue. The broken bones then were cobbled together with pins in what is known as a Secured Pin Intramedullary Dorsal Epoxy Resin Frame (SPIDER) until they healed. A three-inch custom-made implant for Missy's knee on her other leg was manufactured out of stainless steel by Fitzpatrick, Blunn, and Jay Meswania of OrthoFitz Implants in Godalming, Surrey, and later secured to her thigh and shin bones with cement. "The most difficult thing about the (two and one-half-hour) operation was miniaturizing the implants and matching the hinge motion to allow walking, running and jumping, which cats do a lot of," Fitzpatrick told The Daily Telegraph. "A human patient with a knee replacement would probably walk and maybe even run but would not rarely expect to jump." In spite of his and his colleagues exceptional work with Missy, Fitzpatrick still was singing his old familiar ode to the Grim Reaper. "It was a case of putting Missy to sleep forever or developing an artificial knee, which had never been done before," he swore with a straight face to The Daily Telegraph. "Amputation was not an option since the other hind leg was broken in eight places." Trace, Callie Mae, Howard, Blacky, and countless other cats are living proof of Fitzpatrick's mendacity. 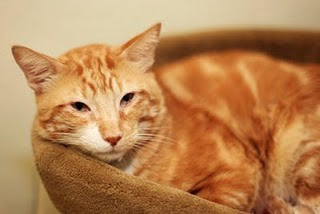 His way or the graveyard are far from being the only alternatives available to disabled cats. As an orthopedic surgeon with little or no regard for either cats or, more importantly, the sanctity of life Fitzpatrick certainly qualifies as a queer duck to say the least. Of course, by framing the debate in such a lopsided fashion he is able to steer more moola to his surgery. Heads are easily turned by scientific and technological breakthroughs but very few of them are either truly useful or desirable. Jean-Jacques Rousseau, for example, took the luster off of both science and the arts way back in 1750 in his essay entitled Discours sur les sciences et les arts. Native American author Vine Deloria Jr. put his finger on the crux of the matter when he once observed: "Western civilization, unfortunately, does not link knowledge and morality but rather it connects knowledge and power and makes them equivalent." That assessment most definitely fits Fitzpatrick and all others who think like him to a tee. To put it another way, the stupendous advances made in science and technology over the past two centuries have not been matched by compensatory strides in moral consciousness. Just as capitalism, organized religion, and mass education are largely scams concocted by a few privileged elites in order to subjugate and exploit the animals, Mother Earth, and hoi polloi, so too are science and technology. Today, however, "there is no one left to ask them (the masses) a single troublesome question. Such as: where have you been and where are you going and is it worthwhile?" John D. MacDonald observed in his 1964 novel The Quick Red Fox. "They are the undisturbed." Finally, the debilitating injuries suffered by Blacky and Missy to their rear quarters leave little doubt that they were run down on purpose and no matter how feverishly Fitzpatrick and his colleagues labor they never will be able to keep pace with the demand for artificial limbs unless vehicular assaults on cats and other animals are criminalized. There is not any known connection but David Cretney of the House of Keys on the isle of Mann in the Irish Sea last month introduced a bill that would require motorists who run down cats to report such incidents to the police. "I saw a cat run over recently and the driver only had to take his foot off the accelerator and he didn't...so I think there are people who would always do that," Sue Critchley of the Mann Cat Sanctuary told the BBC on October 29th. (See "Manx Cats 'Missed' by Collision Laws.") "I'm sure it would maybe stop a few people when they strike a cat, that they say, 'Well, it's now against the law so I'd better stop'." That is not much but it is at least a start on the long road to affording protection to cats against the machinations of motorists. Perhaps some day the world will no longer have much of a need for Fitzpatrick and his bionic implants and, as an added bonus, he will be forced to keep his nickel and dime moralizing closeted, which is precisely where it belongs. Photos: BBC (Oscar), Ingham County Animal Control and Shelter (Howard), John Bisset of The Timaru Herald (Blacky and Broomhall), and Barcroft of The Daily Telegraph (Missy). "We felt that if a cat can be that normal with three legs, I think that they can adapt to two legs." In a profession that is better known for uncaring shekel chasers and gross incompetence, it always is refreshing to learn of veterinarians of the opposing stripe. Dr. Geoffrey Weech of the Monmouth Small Animal Hospital in Wyatt Earp's hometown of Monmouth, Illinois, is one such dedicated practitioner. "We felt that if a cat can be that normal with three legs, I think they can adapt to two legs," he explained to WHBF-TV. Although adjusting to life without her rear legs is going to be difficult, veterinary technician Bridgette O'Malley is not betting against Trace. "She's a fighter for sure because she could have just as easily died in that engine and she fought through everything," she told WHBF-TV in the article cited supra. Since there is not anything wrong with her front legs it might be possible for veterinarians to fit her with some type of prosthetic device that would allow her to regain her mobility. It has been done before with cats that have suffered paralysis in their rear legs and, other than a lack of money, there is not any reason why it could not be done for Trace. The next order of business as far as Weech is concerned is securing a good home for Trace. "It's going (to) have to be somebody that is dedicated to a special needs kitten but I think they're going to be surprised," he predicted. "I think she's really going to come around." Anyone who is interested in welcoming this amazing little kitten, now five months old, into their home can reach the Monmouth Small Animal Hospital at (309) 734-5227. A little over two years ago she was chased up a tree by a group of dogs and subsequently electrocuted when she became entangled in electrical wires. It is not clear from the information available but presumably she broke all four appendages when she fell to the ground. "She's a good kitty," Sandy Tomlin of the Theodore Veterinary Hospital, where Callie Mae lives, told WKRG-TV of Mobile on August 9th. (See YouTube video entitled "Legless Cat Ready to Start Another Life.") "She even caught a mouse one time." Someone has to scratch, groom, and brush her and she is forced to use Wee-Wee Pads as opposed to a litter box but otherwise she is doing remarkably well. Moreover, her courage and determination to live has had a profound effect upon Tomlin and her colleagues at the veterinary clinic. Anyone interesting in giving beautiful little Callie Mae a permanent home can contact the Theodore Veterinary Hospital at (251) 653-7831. They are difficult to locate, especially in times of need, but caring veterinarians who place saving lives ahead of lining their pockets do exist. They are, however, a distinct minority within the profession. Photos: WHBF-TV (Trace) and WKRG-TV (Callie Mae). "It's weird. It's really true that he seems to understand things. He knows when he can help. He alerts us when things aren't right about a cat." As the anecdotal evidence continues to mount it is becoming clearer with each passing day that at least some cats are either psychic or possess an astonishing sense of empathy. 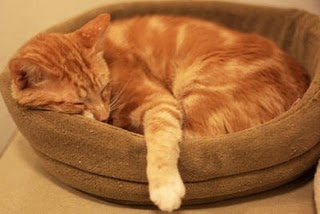 The latest such amazing cat to garner worldwide attention is a four- to five-year-old orange and white male named Christopher who resides at Nine Lives Foundation's Feline Well-Care Clinic in Redwood City, California. Nine Lives' founder Monica Thompson readily concurs. "It' weird. It's really true that he seems to understand things," she told The Mercury News. "He knows when he can help. He alerts us when things aren't right about a cat." In addition to comforting fellow felines in need, Christopher also is adept at socializing homeless kittens. For example, back in July he took a pair of abandoned waifs under his care and within a couple of weeks he had dispelled their fear of humans. "The kittens were so excited to see (him) that when he left (their) cage they would sit and cry," Thompson added in the interview with The Mercury News. As compelling as his work with other cats and kittens has been, Christopher's own personal history is even more remarkable. In March, he ruthlessly was run down and left for dead by a motorist on Crystal Springs Road. Luckily for him, he was rescued by kindhearted bicyclists Elizabeth Benishin and Wayne Smith who eventually were able to get him to Nine Lives. Even with that hurdle out of the way he was not expected to walk again. He confounded his doubters, however, and after emergency surgery and several weeks of recuperation he soon was up and about again. "One day while his cage was being cleaned, Christopher decided he was done with sitting in his cage and jumped onto the exam floor room," Thompson related to The Examiner of San Francisco on August 12th. (See "Miracle Cat's Recovery Purring Along at Vet Center.") "From that day forward, he worked a little each day to strengthen his muscles and was soon walking with ease and even running." July 11th marked a turning point in Christopher's life because that was when Nine Lives accidentally discovered that he has type B blood which is found in approximately only five per cent of all cats, mostly purebreds. 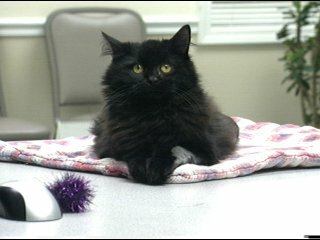 That occurred when an anemic black kitten from the Humanimal Connection in Los Altos arrived at the clinic in dire need of a blood transfusion. The kitten was in fact so low on blood that Thompson was unable to draw enough in order to even type it. Since Christopher was jumping up on the operating table and nuzzling the kitten Thompson on an impulse grabbed him and used his blood to treat it. Against all odds, both cats turned out to have type B blood flowing in their veins and the transfusion was a rousing success. The kitten subsequently recovered and was returned to the Humanimal Connection. None of that in any way alters the salient fact that Thompson's flagrant disregard for established veterinary practice just as easily could have killed the kitten. Moreover, it is doubtful that many cat owners would be too thrilled at the thought of her pumping untyped blood into the veins of their beloved companions. Be that as it may, Christopher's fate now was sealed. With Nine Lives coveting his valuable blood, it is not about to put him up for adoption anytime soon. He "serves a purpose" at the clinic, Thompson told The Mercury News in the article cited supra. "Who knows how many cats he'll save in the years ahead?" Lowery parroted his boss in the same article. Although donating blood is considered to be a safe procedure as far as cats are concerned, it is not without its health risks. For example, all donors are sedated for ten minutes while approximately fifty-three milliliters of blood are drawn. It takes another four hours, however, for the barbiturates to wear off and for a cat to regain the full use of all of its faculties. Furthermore, it is difficult to imagine any circumstances where the ingestion of barbiturates ever could be in a cat's best interest. In fact, some of them that are sedated for routine sterilizations and airplane flights never regain consciousness. Next, a patch of fur is shaved away from their necks and one of their jugular veins is tapped; this is standard procedure with all vets except a handful that still draw blood from the legs. The removal of their fur in such a vulnerable location in turn exposes them to the risk of being seriously injured either by other cats or sharp objects. Bruising also is common at the donation site and usually lasts for three or so days. 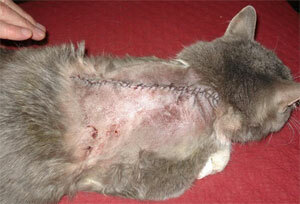 Although the needles used to draw blood are sterilized beforehand, inflammation always is a concern with cats. A precipitate drop in blood pressure as indicated by pale gums, rapid heart rates, and poor pulses also is common in donor cats and therefore necessitates that fluids be administered during and after the procedure. Repeated donations sometimes can lead to the onset of chronic anemia. Although there are considerable differences in the various protocols observed by surgeries, donor cats generally must be between the ages of one and eight and are precluded from giving blood any more frequently than once every three months. Considering his age, Nine Lives most likely is planning on holding Christopher hostage for the next three to four years so that it can drain him dry. He therefore could be facing up to sixteen of these grueling, life-threatening procedures. Donor cats are treated considerably more humanely by the St. Tammany Humane Society in Covington, Louisiana, which only recently lent a two-year-old tortoiseshell named Peony to the Louisiana Veterinary Referral and Emergency Center in Mandeville as a donor cat. As far as it is known, all surgeries further stipulate that donor cats must be sterilized and consequently Christopher surely was divested of his testicles upon arrival at Nine Lives; that is, if he had any left by that time. It could be argued that a more humane approach would have been to have left him intact with the hope that some of his offspring also would possess type B blood. That way the burden of donating could have been parceled out amongst several cats. Much more to the point, there should be limits not only on the number of times that a cat can be used as a donor during the course of a calendar year but also on the number of years that one can be employed in such a fashion. Ideally, no cat should be put through this process more than once in a lifetime. Donor cats additionally are cruelly cooped up inside throughout their tenure of indentured servitude and even the EPA freely acknowledges that indoor environments are far more polluted than the world outdoors. On top of that Christopher most likely is forced to spend a disproportionate amount of his time confined to a cage and probably is left all alone nights, weekends, and holidays. Above all, cats are entitled to their freedom. They need fresh air and sunshine like all living creatures. They should be allowed to wallow in green grass, to tramp through fallen leaves, to experience the chill of autumn and the cold of winter, as well as to feel the rain and snow in their faces. Veterinary offices are by definition chock-full of sick and injured animals and as a consequence they, like shelters, are not the most hygienic environments for cats. Also, whereas most surgeries segregate donor cats, Christopher is allowed to mingle with the patients which increases the odds that he might contract a disease. To shanghai unconsenting cats into becoming long-term blood donors is the very epitome of inhumane and barbaric behavior. If any medical doctor ever were caught doing likewise to a patient that practitioner would be jailed and the same logic should be applied to those who treat cats in a similar fashion. Besides, it is unnecessary for Nine Lives to treat Christopher so shabbily in that there are numerous animal blood banks scattered around the country. Of course, Nine Lives is compelled to pay for that blood whereas it is considerably cheaper for it to simply take it from Christopher by force. Christopher is by no means an isolated case. Tens of thousands of cats and dogs are at this very moment languishing in the back rooms of veterinary establishments. Tucked neatly away from the prying eyes of both animal rights activists and the public they live, suffer, and die in obscurity. Out of sight, as per usual, translates into being out of mind and beyond the reach of all compassion. Nine Lives in all likelihood already has been paid in full by Benishin and Smith for treating Christopher's fractured pelvis and it has benefited in spades from the remarkable work that he has performed with other felines. His notoriety in the press and on Facebook no doubt also has led to a marked increase in donations. The time therefore has come for Nine Lives to stop exploiting him and to put him up for adoption. He deserves to be in a loving home where he is respected for the extraordinary cat that he is instead of having the blood routinely sucked out of him. In a YouTube video entitled simply "Nine Lives Foundation," Thompson speaks of her love for cats and of her desire to add a sanctuary to her organization's existing surgery and shelter. That is all highly commendable but what is conspicuously lacking in her eloquence and incessant begging for money is a total lack of respect for cats like Christopher. Quite obviously her sense of empathy is every bit as retarded as Christopher's is developed. Great works still ring hollow if they are not accompanied by compassion and a genuine respect for animals and their rights. For example, any advocate for children would be scorned and ridiculed as a hypocrite if she neglected and exploited her own offspring and the same logic applies to cats. Sadly, unless something drastic is done all that Christopher has to look forward to over the course of the next four years is a quarterly regimen of being sedated, shaven, and poked with a needle. Photos: Nine Lives (Christopher), Facebook (Benishin), and St. Tammany News (Peony). "I get the feeling that this is the last time in history when the offbeats like me will have a chance to live free in the nooks and crannies of the huge and rigid structure of an increasingly codified society. Fifty years from now I would be hunted down in the street. They would drill little holes in my skull and make me sensible and reliable and adjusted." Millions of cats have been tagged with microchips during the past twenty years in spite of the fact that researchers have known since the mid-1990s that these implants sometimes cause cancer in dogs as well as in laboratory rats and mice. Although the evidence as far as cats are concerned is anecdotal, the issue finally is sub juris after Cambridge, Massachusetts, resident Andrea Rutherford filed suit on October 4th against chipmaker Digital Angel of St. Paul, Minnesota, and its distributor, Merck Sharp and Dohme of West Trenton, New Jersey. Bulkin's life-threatening ordeal began on February 2, 2005 when Rutherford paid Paul Constantino of South Bay Veterinary Group in Boston to implant a HomeAgain® microchip in her. On October 17, 2007, an unidentified veterinarian from the same surgery removed a lump from Bulkin that had grown up around the chip. The following day Antec Diagnostics of Lake Success on Long Island concluded from a biopsy that the lump was a fibrosarcoma of moderate malignancy. Bulkin promptly was referred to the New England Veterinary Oncology Group in Waltham where oncologist Michelle L. Silver concluded that her cancer "likely" was induced by the chip. Bulkin subsequently was treated with both chemotherapy and radiation and as far as it could be determined is still alive today. Exactly what shape she is in and her prognosis are not spelled out in court documents. The truly frightening thing about cancer is that it can reoccur and metastasize without any warming. To date, she has been forced to undergo three traumatic operations in order to remove lumps, two of which were cancerous, that have materialized at the site. Her current condition is unknown. The implantation of microchips at vaccination sites also have been known to cause cancer. That was the sad fate that befell an unidentified fourteen-year-old spayed American Shorthair. "Veterinarians should be aware that because inflammation may predispose felines to tumor formation, separation and observation of vaccination and implantation sites are indicated," Meighan K. Daly and her colleagues at the University of Georgia in Athens wrote in an article entitled "Fibrosarcoma Adjacent to the Site of Microchip Implantation in a Cat" that appeared in the online edition of the Journal of Feline Medicine and Surgery on March 3, 2008 and in print in volume 10, issue 2, April 2008, pages 202-205. Some veterinarians are such blooming idiots that they even implant microchips right on top of cats' spinal cords. Not unexpectedly, such slipshod work leads of paralysis which is exactly what happened to an unidentified two-year-old neutered male cat that Simon Platt and his colleagues at the Centre for Small Animals in Newmarket, Suffolk, detailed in an article entitled "Spinal Cord Injury Resulting from Incorrect Microchip Placement in a Cat" that appeared in the online edition of the Journal of Feline Medicine and Surgery on September 18, 2006 and in print in volume 9, issue 2, April 2007, pages 157-160. The chip subsequently was surgically removed and the cat eventually regained the use of his legs although a degree of paralysis persisted in his left front appendage. Other than that no additional information about his condition has been made public. In addition to sarcomas that develop at the sites of chip implants and those that foolishly are implanted on spinal cords and at vaccination sites, the chips themselves very well could be toxic. A certain amount of risk accompanies all invasive procedures and it generally is not a good idea to either implant, inject, or swallow foreign objects except as a last resort in order to save a life. The fact that only a handful of cat and dog owners have come forward to report cancers should not be taken as evidence of the relative safety of implanted microchips. That very likely can be attributed to either the reluctance or inability of pet owners to foot the bill for an animal that has developed cancer. The same is true of seeking legal redress which is not only expensive and time consuming but fraught with all sorts of uncertainties to boot. For example, when an outbreak of Bovine Spongiform Encephalopathy led to the destruction and disposal of 4.4 million cows in Angleterre during the 1990s, only approximately one-hundred or so cat owners were willing to pay for necropsies which confirmed that their companions had died from the variant Feline Spongiform Encephalopathy (FSE). On that point he obviously is talking through his hat in that even a ruling in favor of his client is hardly gong to settle this controversy. That would require a class-action lawsuit involving at least hundreds of aggrieved pet owners. If successful, such action might ultimately force the FDA to order the devices off the market. Even more alarming, Rutherford's suit in no way tackles the glaring culpability of Constantino and South Bay Veterinary Group. A recent visit to the surgery's web site revealed not only that Constantino is still employed there but that it is continuing to enthusiastically hawk these cancer-causing devices to a gullible public. "The HomeAgain® chip is the newest way to make sure your pet is well identified," a February 2, 2009 article declares. (See "HomeAgain® Microchip.") Quite obviously this surgery is every bit as shameless as it is irresponsible and greedy. The profession's ignoble penchant for putting shekel accumulation ahead of both saving lives and treating legitimate illnesses is demonstrated time and time again by its willingness to kill perfectly healthy animals under the guise of euthanasia and to administer all sorts of unnecessary inoculations. Back in 2005, for example, the Chicago law firm of Childress, Duffy, and Goldblatt announced its intention to bring a class-action lawsuit against the profession for administering a wide range of unnecessary vaccinations to cats and dogs that sometimes result in the formation of vaccine associated sarcomas (VAS). That worthy undertaking must have fizzled out for one reason or another because nothing further was ever heard of the matter. Shelters and so-called humane groups are even worse in that just about all of them microchip the cats and dogs that they offer to the public for adoption; the remainder they systematically exterminate. These implants, along with superfluous inoculations, allow them to jack up the prices that they charge for the handful of animals that they sell back to the public. By behaving in such a patently inhumane manner it is clear that they look upon the animals that they take in as little more than animated 401(k) plans. C'est-à-dire, they are merely investments from which they strive to reap the highest yield. Of late, a large number of municipalities in the United States have gotten in on the microchipping craze and now are requiring that all dogs receive the implants. El Paso, Texas, even requires the same of cats. They likewise are every bit as guilty of killing cats, dogs, and other animals as Digital Angel, Merck, veterinarians, and shelters. That line of reasoning also could be extended to include the mass media and web sites that continue to accept advertising revenue from firms that they know are deliberately killing animals. Lost in this debate is the petit fait that as protective devices microchips are virtually worthless. They in no way protect animals from those who are intent upon doing them harm. In particular, they are powerless against the machinations of poisoners, motorists, thieves, and yobs armed in air guns and crossbows. Microchips are only valuable when cats and dogs turn up at shelters and veterinarians' offices that are equipped with scanners in order to read them and even that process is far from being foolproof. For instance, chips not only operate at different frequencies but multiple scanners are required in order to read all of the different brands on the market. On their way home, immigration officials in Calais were unable to read Coco's chip and therefore refused to allow him to return to England with them. They then traveled to Dunkirk where they inveigled a veterinarian to surgically remove the chip. Much to their chagrin, the scanners still were unable to read the chip. The couple thus was forced to place Coco in quarantine while they returned home to Bury without him. The Birtwistles later estimated that Coco's microchip misadventures had cost them thousands of pounds in veterinary, quarantine, and administrative fees. "We want to warn all other holidaymakers about this," Jane told the Daily Mail on April 17, 2007. (See "Impounded: Family Forced to Leave Their Dog in France Because Officials Couldn't Scan Its ID Chip.") "When you leave the United Kingdom your dog isn't scanned at passport control so there is no way of knowing if your pet's microchip has failed until you try to get back in the United Kingdom." Coco was by no means an isolated case and beginning in July of next year all cats and dogs traveling across borders in Europe will be required to be microchipped. It is indeed ironic that at a time when citizens from the fifteen countries participating in the Schengen Agreement are allowed to travel freely on one visa that a far more sinister and deadly Iron Curtain has been constructed out of Silicon Valley snake oil in order to keep out companion animals. Sometimes Europeans demonstrate considerably more compassion and foresight when it comes to animals than do their American cousins while at other times they behave like mindless dupes bereft of even a smidgen of intellectual skepticism. Their wholehearted acceptance of implanted microchips quite obviously falls into the latter category. In the final analysis it is up to pet owners to weigh the tradeoffs between the minimalist protections afforded by microchips and the risk, no matter how great or small, that their beloved companions will be stricken with cancer as the result of having them implanted. That should be a no-brainer for most individuals since cats and dogs can live without microchips but attempting to live with cancer is an altogether different matter. At the very least, proponents of microchipping should be compelled to demonstrate conclusively the safety of the devices. The debasement and subjugation of the animal kingdom extends far beyond cats, dogs, and laboratory animals. Most notably, just about all animals used in the immoral and shameful production of meat have microchips implanted in them that track their unrelenting misery from birth to the slaughterhouse. It therefore would not be surprising if these animals also develop cancers. If so, that likely means that the public is consuming cancerous meat. The situation with wildlife has grown to be every bit as horrendous ever since men and women of conscience abandoned them to the machinations of thoroughly evil wildlife biologists who are hellbent upon degrading and enslaving them. Operating under the guise of saving them, these impostors relentlessly hound down large mammals, tranquilize them, and then fit them with radio collars. Smaller animals, such as fish and snakes, are tagged with implanted microchips in much the same fashion as cats, dogs, and livestock. Accordingly, they also could be dying of cancer. The health risks associated with microchips and radio collars are gruesome enough themselves but there is an ever far more fundamental issue involved. To put it succinctly, the power to control translates into the power to know and that in turn equates with the power to kill. For example, wildlife biologists routinely track down and murder big cats, wolves, bears, and other animals simply by homing in on the frequencies emitted by their radio collars. The doomed animals attempt to run but they are powerless to escape and sooner or later are mercilessly gunned down by assassins in either helicopters or airplanes. The same cruel fate is destined to befall mankind. Moreover, through his unquestioning embrace of computers, mobile phones, and social networking sites man is running headlong into the very same pillories that are destined to bind him hard and fast forever. "I get the feeling that this is the last time in history when the offbeats like me will have a chance to live free in the nooks and crannies of the huge and rigid structure of an increasingly codified society," John D. MacDonald's fictional character Travis McGee sagely predicted way back in 1964 in The Quick Red Fox. "Fifty years from now I would be hunted down in the street. They would drill little holes in my skull and make me sensible and reliable and adjusted." Nowadays it is not merely offbeats like McGee that are trapped in the totalitarians' spiraling web of intrigue but all of creation. It could be argued that if man no longer possesses any higher ambition than that of being a fat slave that he richly deserves his impending fate. He is, after all, a highly flexible being who is capable of adapting to almost any way of life no matter how shameful. The animals, however, are not nearly as resilient. Take away their freedom and they cease to exist except as crude caricatures of their former selves as is seen with those that are cruelly imprisoned in zoos and at captive breeding facilities. "Love the animals. God has given them the rudiments of thought and joy untroubled," Fyodor Dostoyevsky wrote in the Brothers Karamazov. "Don't trouble it, don't harass them, don't deprive them of their happiness, don't work against God's intent." Paul McCartney once said essentially the same thing only a bit differently. "We've beaten into submission every animal on the face of the earth, so we are the clear winners of whatever battle is going on between the species," he observed. "Couldn't we be generous? I really do think it's time to get nice. No need to keep beating up on them. I thank we've got to show that we're kind." Suffice it to say that individuals who truly care about animals never want to see them either subjugated or ravaged by man-induced cancers. Photos: Steven M. Wise (Bulkin), chipmenot.com (Halo), Daily Mail (Coco), and the BBC (Lennart).